Senior appointments at the University of New England’s residential colleges will provide closer links between the academic and collegiate cultures on campus. UNE’s Vice-Chancellor, Professor Jim Barber, said the recent appointment of Deans and Academic Masters to Robb and Earle Page Colleges would strengthen the academic, sporting and cultural excellence of both colleges. “These new positions are integral to UNE’s aspiration to become Australia’s pre-eminent collegiate University,” Professor Barber said. The Deans will provide leadership and direction in the social and community welfare and life skills of college residents, while the Academic Masters will provide leadership of the academic portfolio for the college community – including providing advice on academic standards and programs for the residents. “Generations of UNE graduates have benefited not just from their university education, but from the personal formation that college life provides,” Professor Barber said. “These appointments are about providing residents with the best quality on-campus experience while also re-affirming our commitment to enhance the college system at UNE. Michael Barton joins UNE from Snowy Mountains Grammar School in Jindabyne, NSW, and has worked in a number of boarding schools in Queensland and NSW. He is originally from the Tamworth area and has strong family connections to the New England and North West regions. His background is in the fields of education and leadership – having completed his Bachelor of Education degree program with UNE and postgraduate studies at Master’s level in education and leadership. He is currently completing his doctoral research with a focus on exploring factors associated with students transitioning into secondary boarding schools. Cameron Moore is a Senior Lecturer in UNE’s School of Law. His publications include the book ADF on the Beat: A Legal Analysis of Offshore Enforcement by the ADF (2004) and other articles and chapters on the Australian Defence Force and maritime security. His teaching areas include environmental law, natural resources law and law of the sea. Between 1996 and 2003, Mr Moore was a Legal Officer in the Royal Australian Navy, serving at sea as well as advising on fisheries and border protection operations and the TAMPA incident. Ms Penny Biddle (pictured here) comes to Earle Page College with extensive experience working in the university sector, including student accommodation at Charles Darwin University. She has completed a BSc degree program (majoring in Geology and Organic Chemistry), and Master of Business Administration (while living in Eusoff College at the National University of Singapore) and Master of Career Development programs. Penny has relocated to Armidale from Hervey Bay. 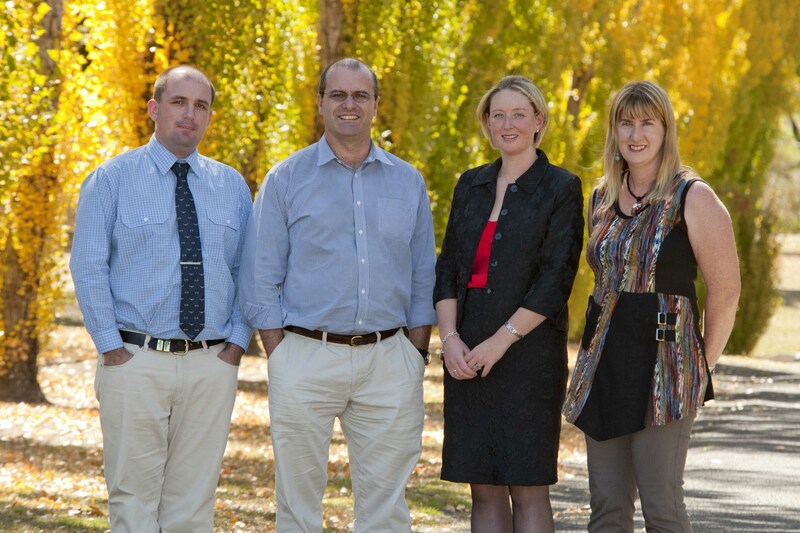 Dr Amanda Kennedy is the Deputy Director of the Australian Centre for Agriculture and Law at UNE. She has BCom/ LLB (Hons) and PhD degrees from UNE, a Grad. Dip. Legal Practice (College of Law), and a Grad. Cert. Law Teaching (Monash), and is admitted as a Lawyer of the Supreme Court of NSW. Amanda’s research interests are in the areas of contract law, natural resources law and dispute resolution, and she is currently leading a three-year project, funded by the Australian Research Council, exploring conflict over natural resources. THE PHOTOGRAPH of Penny Biddle displayed above expands to include (from left) Michael Barton, Cameron Moore, and Dr Amanda Kennedy.